The foam is a high quality Polyolefin with excellent dimensional tolerances and good elongation, with a high degree of colour stability and excellent key to the adhesive surface. The thickness and density range has been chosen to offer a conformable product for uneven, irregular or contoured materials. The rubber adhesive has very high cohesive strength which produces very high bond strengths. The solvent based rubber adhesive has good tack and peel peformance and in particular a high affinity for low energy surfaces such as PE. 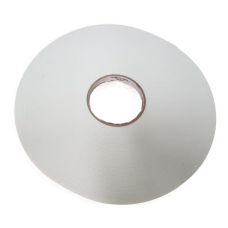 The product is available as a white double sided tape, in thickness from 1.0 to 3.0 mm, protected by a siliconised glassine paper liner. Single sided products may be available upon request, subject to reasonable MOQs. Multi Purpose PE foam mounting tape, with high shear rubber adhesive. General purpose bonding of two substrates.